I am having a problem drawing optical ray lines for optical systems. Namely, one which have a formation of image of the first lens beyond the second lens. Ray lines can always be drawn using Snell's law. But If you want to find the image only by basic properties(lines parallel to principle axis and passing through the optical center) of lenses then find the image for the first convex lens. Now if this image happens to be at the left of the second concave lens, you can take it again as an object for the second concave lens and can find the final image easily. But in your case the image due to convex lens would be formed at 80 cm(>d=60cm) if the concave lens would not be there.But it would not still be problem. 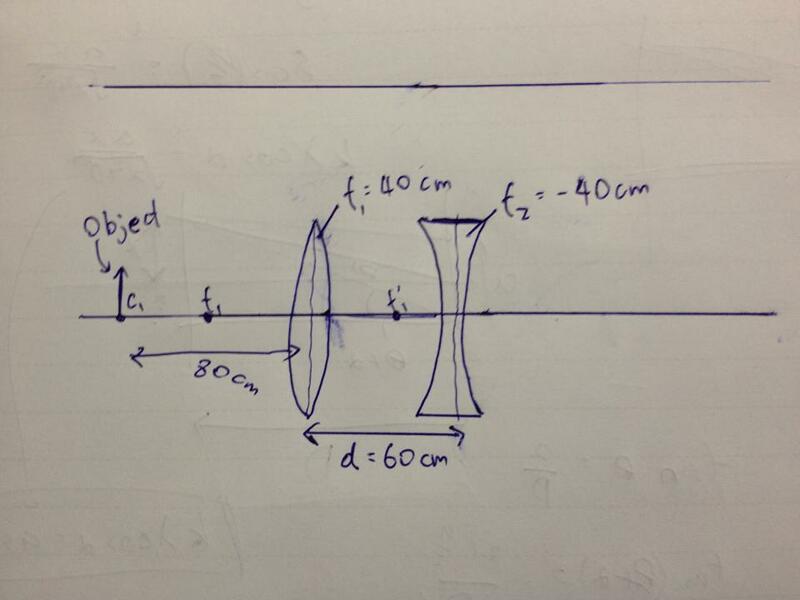 Just draw the first image as if the concave lens is not present there. Remember though you have found the image point by drawing only two lines, actual image will have all the possible lines between the object point and image point through the convex lens. Now out of these lines draw a parallel line with the principal axis from the image point and a line passing through the centre of the concave lens from the image point. Now these are the two lines you were searching for to make the final image. Note:I am sure enough I don't need to say you where the dotted and solid lines should be. Not the answer you're looking for? Browse other questions tagged homework-and-exercises optics lenses or ask your own question. Can I use one convex lens to create a telescope? Why don't spectacles form these weird images?